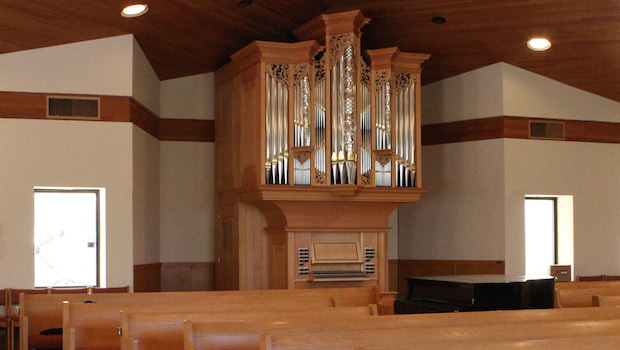 The organ at St. Alban’s was built in 2012 by Paul Fritts and Associates of Tacoma, Washington, as the firm’s Opus 35. 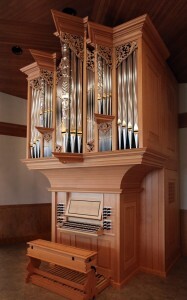 With 22 stops on two manuals and pedal, its design represents an expansion of the Fritts organ in a chapel of St. Mark’s Episcopal Cathedral in Seattle. It is the only tracker organ in a public space in southern Arizona. 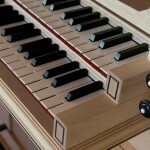 Though inspired by the great Baroque organs of northern Europe, it is not a copy of any prior instrument. Its stoplist features a balanced principal chorus undergirded by a 16′ Quintadena on Manual I, a wealth of flute color, and three reed stops. Two string stops on Manual II, a Violdigamba and Voix Celeste, are useful in Italian and South German music and extend the instrument’s capability surprisingly into the 19th century. Decorative elements include façade pipes of 90 percent tin, some of them embossed; keyboards with bone naturals and ebony sharps; and carvings by the builder’s sister Judy Fritts. The organ was featured in the March 2014 issue of The Diapason. Organ concert for the benefit of raising funds for repair of the Schantz pipe organ at St. Mark’s. St. Alban’s organists Jane Haman, Scott Jones, John McLean, and Stephen Keyl perform music of Bach, Frescobaldi, Franck, and others on the Paul Fritts organ at St. Alban’s. Admission free; donations accepted. 3:00pm – Executive Board Meeting 4:00pm – Membership Meeting 5:00pm – Let’s Eat! !